For more than a decade I worked with other faculty to help establish an Environmental Studies Program at UConn. Since the outset, I’ve guest lectured in the introductory course. My recent scholarship focusses on the science of Henry David Thoreau, the patron saint of America’s environmental movement. 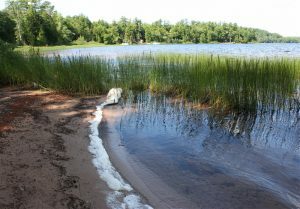 Photo: Persistent suds on the beach of a small lake in Michigan indicate the presence of chemical compounds that lower the surface tension of water. This can be natural or due to pollution from detergents.